Horses have been admired by humans for centuries, but many questions remain about how they developed their unrivalled athleticism, as well as fascinating adaptations such as the equine foot. The traditional story of horse evolution is well known. Over time, horses became larger and developed higher-crowned teeth. They changed from having three toes, known as tridactyly, to having a single toe, called monodactyly. However, the evolutionary advantages of having a single toe – as we see in modern horses – are not entirely clear, other than the notion that it must somehow be “more efficient”, especially with their large body size. Paleontologist Christine Janis and Raymond Bernor, a professor of anatomy who specializes in evolutionary biology, say it is not commonly appreciated that the reduction from three toes to one was not the main anatomical foot transition in equid history. Rather, the most important adaptation was the change from the original “pad foot” into the “spring foot”, with the development of the limb posture we see in horses today. The pair, in a review published this week in the journal Frontiers in Ecology and Evolution, have explored the evolution of the single toe in equids, and put forward a new hypothesis for why it developed. Janis, from Brown University in Rhode Island and Bristol University in England, and Bernor, who is with Howard University in Washington DC, noted that the wider equinae tribes — Hipparionini, Protohippini, and Equini — evolved high-crowned teeth and diverged into both small and large body sizes. However, the single toe evolved only within the equini. Equus, they noted, were successful during the Plio-Pleistocene period, which ranged from about 5 million years ago to just 12,000 years ago. However, going back further, the Hipparionini was by far the richest tribe in terms of diversity and numbers, but remained persistently three-toed. The pair argued that, in considering why the single toe evolved among the forbears of the modern horse – a feature inherited from their smaller ancestors – researchers also needed to considered why it never evolved in the Hipparionini. They reviewed scientific literature on equid locomotor biomechanics and evolution, proposing that the modern equine foot is primarily an adaptation for increasing locomotor efficiency via elastic energy storage, and that the accompanying digit reduction may be circumstantial rather than adaptive. But what drove the change in the first instance? The pair showed that single-toed equines combine a more extensive suspensory apparatus in the foot with a less flexible back than hipparioninins, pointing to not only increased locomotor efficiency but also a difference in the preferred gait for travel at speeds faster than a walk. The authors propose that, during their initial appearance in North America, singled-toed equines adopted a diet that required a greater extent of daily or seasonal roaming behavior than that of their contemporary three-toed horses. The trot, they said, was likely to be a more efficient gait for distance travel than, for example, the running-walk, which is likely to be metabolically more expensive. It was evident from their body adaptations that single-toed horses were maximizing their capacity for elastic energy recovery, but why would this also be associated with the loss of the other two digits? The pair said the argument that the single-toe is an evolutionary “improvement” in equid locomotion does not explain the persistence of three-toed horses for millions of years after single-toed horses first appeared, nor why only a single equid lineage made the transition to the single toe. For example, the Old World hipparionins were highly diverse, and paralleled the New World horses in changes in body size and tooth development, yet they showed no trend toward being single-toed. Monodactyly was first apparent in North America, with the genus Pliohippus around 15 million years ago. At this time, three-toed equines were the predominant form. Indeed, three-toed equines did not decrease in diversity until around 5 million years ago, by which time they had become increasingly restricted to more southern regions. They became extinct in North America around two million years ago, and extinct in southern Asia and Africa less than a million years ago. This left the planet with only single-toed equines. “Considering the early evolution of monodactyly, rather than the eventual success of Equus, monodactyl horses must initially have been doing something different in a world where tridactyl horses were predominant. “We propose that the divergence of the lineage of equines that became monodactyl from their tridactyl relatives had its origins in a difference in diet and foraging behavior. “We propose that North American Miocene monodactyl horses adopted a feeding regime that entailed a greater extent of roaming behavior, on a daily and/or seasonal basis. “African zebras evolved as part of a migratory ungulate community that was dependent on long-distance roaming,” they noted. A greater extent of roaming behavior would have led to limb adaptations that supported more efficient distance transport. But the locomotory issue for these roaming horses may have been for a combination of speed and efficiency for daily travel between patchy resources of food. “Wild horses are known to trot for daily distance travel; the trot was used for efficient transport by the US cavalry, and endurance equestrians habitually select the trot gait. The trot gait involves a much greater degree of storage of elastic energy in the flexor tendons than the walk. They propose that a preference for the trot drove the evolution of the single toe. The adoption of the trot as the preferred medium-speed gait may have been a key difference between these equines and hipparionins, and also explain differences between their backs. Janis and Bernor noted that both single-toed and three-toed equines had a “spring foot” that would have promoted storage and recovery of elastic energy during locomotion. But the bone-related evidence suggested the adaptation in single-toed equines primarily reflects a greater extent of energy storage and recovery during locomotion, and hence more economical transport. As North America became drier early in the Pliocene, the remaining three-toed equines became more or less restricted to more southern regions, while the single-toed equines diversified in the more northern grasslands, most likely following dietary preferences and differing foraging behaviors. 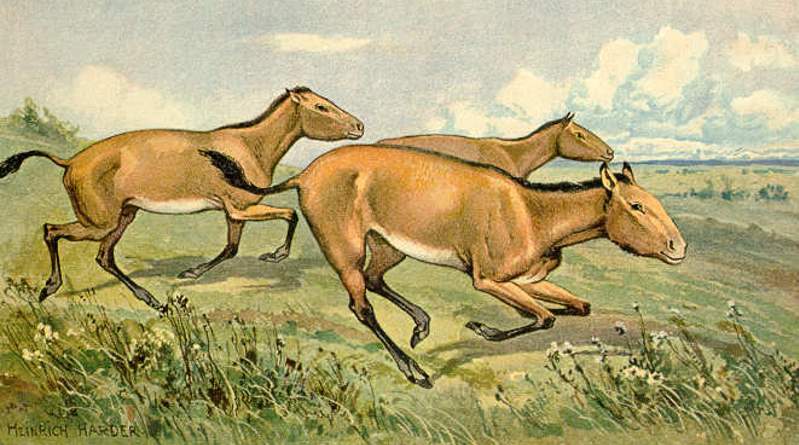 Even after the genus Equus migrated to the Old World around 2.6 million years ago across what is now the Bering Strait, the hipparionins were still present, although of reduced diversity; but hipparionins persisted alongside of Equus until sometime later than a million years ago in China and Africa. The single toe, they argue, represents a change arising from their roaming foraging behavior that ultimately proved useful for the cooler and more arid world of the Plio-Pleistocene and the present day. This novel adaptation set the stage for the genus Equus to survive and flourish globally in the Plio-Pleistocene, while the tridactyl horses that had dominated the late Miocene were not so fortunate. Christine M. Janis and Raymond L. Bernor.